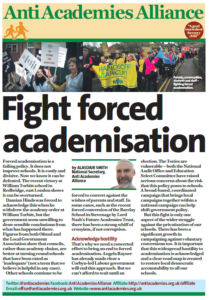 The government’s drive to force yet more academies upon the education sector is another episode in a long saga of disregard for what parents, teachers and communities want. A pledge to convert ‘up to 1,000’ schools is as irrational as it is impractical. Head teachers are already in short supply, so the promise to sack more of them will simply exacerbate the problem. Where does Nicky Morgan imagine that new teachers and heads will come from? Nicky Morgan justifies this extended and accelerated privatisation of our school system by claiming that the government cares about standards. Yet there is now a mountain of evidence which shows that there is no ‘academy effect’ on standards in schools. Indeed, research by the Sutton Trust concluded that the very poor results of some academy chains – both for pupils generally and for the disadvantaged pupils they were particularly envisaged to support – comprised ‘a clear and urgent problem’. Not only that but today’s education and adoption bill seeks to target primary schools in its attack on 1,000 schools deemed to be ‘failing’ or ‘coasting’. This is despite there being no evidence-base whatsoever supporting the idea that academy status is a positive good in the primary sector. Even the Commons Education Select Committee agrees that ‘there is no convincing evidence’ on the effectiveness of the programme. Indeed, the Local Schools Network argues that there is in fact a negative impact. There are well over 100 academies deemed ‘inadequate’ by Ofsted – some 4.4% of those already in existence, according to April 2015 figures. This compares to less than 1.8% of community schools. A change in structure is not axiomatically the path to school improvement. It is irresponsible to tell parents otherwise. In 2010, the coalition government railroaded through its Academies Act with the minimum of consultation, and with a haste comparable to the Dangerous Dogs Act. The Academies Act made it impossible for new schools to be built unless they were academies or free schools. The promise was that free schools would be parent-led but in reality are predominantly the preserve of academy chains. 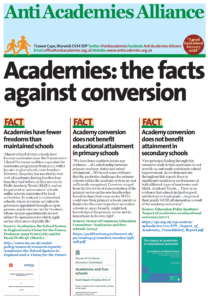 The coalition government was not shy about forcing and coercing schools towards academisation. Today, the Department for Education has even sought to further smear Downhills Primary, a school which was targeted for conversion despite the fact that it was improving and a poll of parents showed that 94% wanted it to remain a community school. 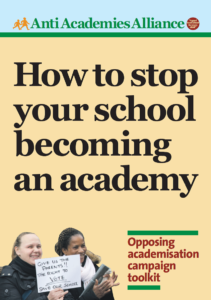 The Academies Act was driven by ideology, not evidence, and today’s Education and Adoption Bill builds on this by removing opportunities for consultation and legal challenges on academisation. This is symptomatic of a government which is increasingly hostile to people’s democratic right to challenge decisions made in Westminster. For further evidence witness the attacks on legal aid, judicial review and the latest threat to the Human Rights Act. Now Nicky Morgan seeks not just to ignore dissent, but to silence it altogether. This is an attack on parents and teachers as well as elected local councillors and the communities which schools serve. This is a threat to democracy which will be strongly opposed by campaigners. This entry was posted in Media, News and tagged Nicky Morgan, Unions. Bookmark the permalink.